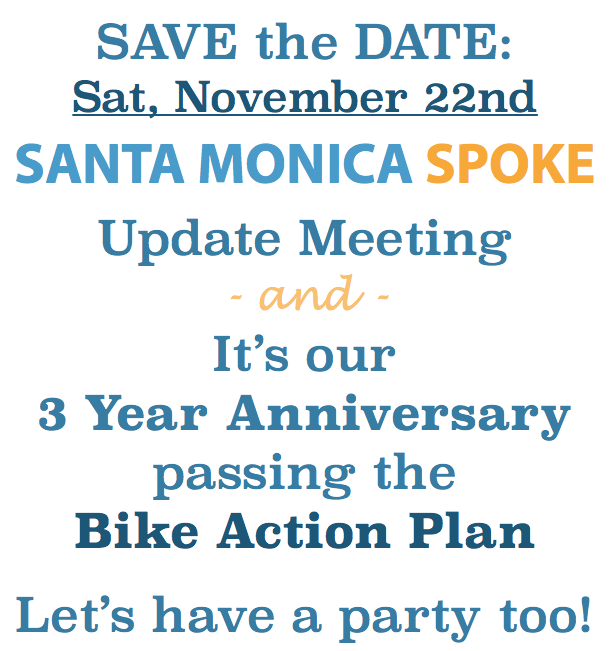 It’s our 3 year anniversary of passing the Bike Action Plan! Let’s have a party too! Program will follow. All ages welcome. This entry was posted in bicycle event, bicycles, Bike Action Plan, bike lanes, Expo Phase 2, infrastructure, leadership, LUCE, Meeting, Pedestrian Action Plan, Safe Routes to School, Santa Monica on November 10, 2014 by Cynthia Rose. This upcoming election is critical for the future of our city, with three City Council seats up for grabs and four important measures on the ballot. Assemblyman Richard Bloom has this to say..
Visit It’sOurLand.org to learn more about Measure LC, to donate or volunteer to the campaign. Measure LC is for “Local Control” and has received overwhelming community support: see the growing list here. Measure D is deceptive and paid for by outside interests! Measure LC was written at the request of residents, 99% of the funding is from small donations almost entirely from within the local community of Santa Monica. Measure LC does not close the Airport but will keep Santa Monica residents in Control of Airport Land. It allows us to manage the airport for the health and safety of our community and not special interests. Measure H will generate new local revenue for the City so that its affordable housing stock can be maintained and rehabilitated, and that more affordable housing opportunities for people who live and work in the city can be created. 100% of the money collected through Measure H will stay in Santa Monica. It is our money for our community – Sacramento cannot touch one cent. Measure HH specifies that voters want the revenue from Measure H to be spent on affordable housing programs. Read why we support H & HH here. This entry was posted in action alert, Bike Action Plan, Bike Infrastructure, infrastructure, leadership, LUCE, Santa Monica on October 20, 2014 by Cynthia Rose. 2525 Michigan Avenue, for one night only. *Car pooling is encouraged bicycle valet will be provided by Santa Monica Spoke. 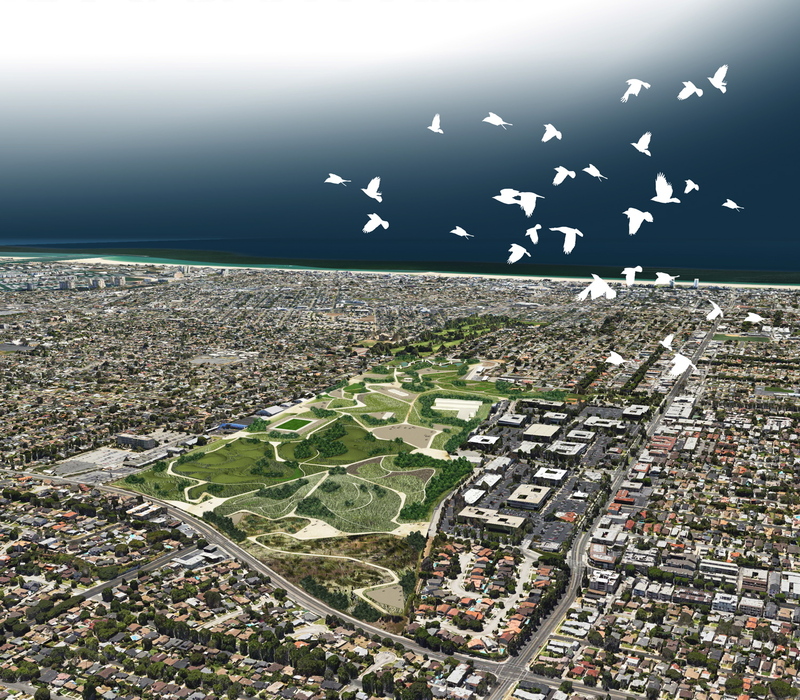 The Exhibition will feature the work of USC graduate landscape architect students, Christopher Sison, Chen Liu, Zeek Magallanes and Yongdan Chunyu who under the direction of internationally renowned landscape architect Aroussiak Gabrielian (FORGROUND Design) took a practical approach in choosing bicycles for the their site visit to Santa Monica Airport where they started working on a three month project to design a park to replace the controversial facility. The tour was lead by Airport2Park.org, a coalition of community groups and neighbors that formed to promote the creation of a great park on the land that is currently Santa Monica Airport. The exhibition is curated by Professor Michael Brodsky of Loyola Marymount University, Founding member of Airport2Park. This entry was posted in Bike Action Plan, infrastructure, leadership, LUCE, Press, Santa Monica on October 14, 2014 by Cynthia Rose. Communities designed for the comfort and safety of people walking are more livable and safer for all users, including people on bikes. Please join the Planning and Community Development Department for a special meeting with the Planning Commission at a COMMUNITY OPEN HOUSE to discuss Santa Monica’s first Pedestrian Action Plan and learn important facts about walking in the city today. At this event, help us shape priorities for improvements to create a world-class walking environment. PEDESTRIAN SAFETY: preview ways the Pedestrian Action Plan seeks to improve crosswalks and sidewalks. COMFORT AND HEALTH: learn about how walking supports a sustainable lifestyle and enhances community well-being. EDUCATION: help staff refine proposed programs to educate drivers, cyclists and pedestrians on sharing streets. Your input will inform this innovative Plan focused on making walking safer and more enjoyable in Santa Monica! Valet bike parking provided. Car parking available on-site. Directly served by the Big Blue Bus lines 7 & 10; lines 1, 2, 3, 8, and 9 also stop within a short walking distance. This entry was posted in infrastructure, leadership, LUCE, Pedestrian Action Plan, Safe Routes to School, Santa Monica on September 15, 2014 by Cynthia Rose. Some of you may have participated in meetings earlier this year to help identify priorities for upcoming service changes that are designed to best integrate transit and Expo Rail when Expo Phase 2 stations open in early 2016. Santa Monica’s Big Blue Bus (BBB) has been collecting input on an Expo Integration Study, an evaluation of potential connections to Metro Rail Expo Line Phase 2 stations scheduled to open in 2016. As part of the study, BBB is been hosting a series of community workshops. Our input is important as routes and iterations could impact our current and future proposed bicycle facilities and help inform opportunities that coordinate bicycle and bus route integration with equitable designs that support the most potential users. Safe pedestrian access and Integrating bikes on buses should be an importation part of this equation as it increases our mobility and helps by extending our range at either end of a trip with multi modal connections / options with bikes, busses & Expo light rail. Big Blue Bus Planning team and consultants at Nelson\Nygaard are pleased to come back with a proposed service plan that they would like to share with you and get your input. As you are already well aware, the expansion of the Expo Line to the Westside will have a significant impact on the BBB service area and will require a new service model with significant changes to many of BBB’s existing routes. The workshops will address bus connections to Expo Line stations as well as the general design of the Big Blue Bus network. Service to Santa Monica, the Westside, UCLA, SMC and other destinations will be discussed. Civic Auditorium, East Wing 1855 Main St.
Santa Monica Main Library, Multi-Purpose Room 601 Santa Monica Blvd. The same information will be presented at each meeting. The Expo Line is projected to carry 64,000 riders per day by the year 2030, but this can only take place if bus connections to stations are made as useful and convenient as possible. 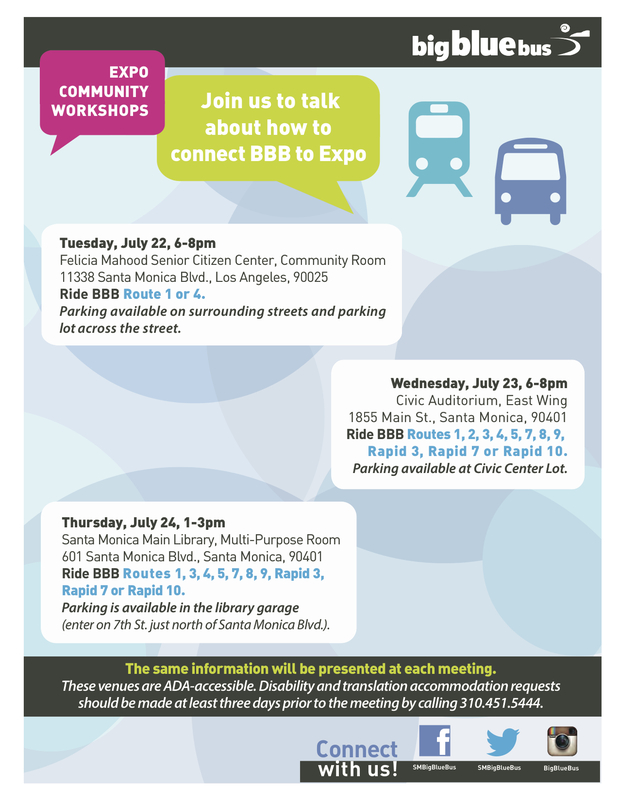 We need your help – BBB would like to get your input as they begin this important phase of service planning for an exciting new future that will make public transit in and out of Santa Monica more accessible and attractive to residents and visitors throughout Los Angeles County. These venues are ADA-accessible. Disability and translation accommodation requests should be made at least three days prior to the meetings by calling BBB Customer Service at (310) 451-5444. This entry was posted in Expo Phase 2, leadership, LUCE, Santa Monica Walks on July 11, 2014 by Cynthia Rose.